Sonor has a reputation for attention to detail and inventive hardware designs, particularly with its drum fittings and tom mounts. So while everything in these three hardware series is most certainly worthy of your consideration, we were still left feeling a teensy bit dissatisfied. Everything is well-made, sturdy and reliable. The SP-473 bass drum pedal is rather basic. The partial use of memory locks is puzzling. The collection overall is a tad uninspiring. Sonor has updated its hardware and here we have the first three levels, all fabricated in China. There's the entry level 100 series and the 200 series, which was developed to accompany Sonor's budget/intermediate Force ranges, which are also made in China. The 400 series is intended to accompany higher-end drums. "The single-braced 100 series snare and hi-hat will suffice for most drummers who want to keep the overall weight of their traps case to a minimum." Comparing the three sets side-by-side, it's obvious they are all from the same source as they share many physical features. As you'd expect, they get heavier and bulkier as you go up the chain. The most obvious difference is that the 100 series has single-braced tripod bases while the 200 and 400 are double-braced with the 400 also having the thickest tubing. Also, the 200 and 400 stands have Sonor's three-section housing clamp. All the cymbal stands have the same tripod base reach, but the 100 stands are significantly lighter and single-strutted. All three series also make use of the same roughly 34cm (13.5") mini boom arm (with 13cm tilter section) except that in the 200 and 400 series it is knurled for better grip. The 100 series straight cymbal stand and hi-hat both have limited height, although the former does have three sections. These would be fine for a younger, growing-up player, or a small jazz group or light rock drummer (ie: someone who's generally seeking lightweight stands for ease of carriage). But a heavy player will likely find the height and stability too limited. Both 200 and 400 series mini-boom cymbal stands are much beefier. The 400 series is the only boom stand with a third section and extends to a towering 135cm (53") at the pivot with the boom arm. Compare this with the maximum total height of the single straight 100 cymbal stand (around 117cm/46"). The 100 and 200 series snare drum stands are essentially similar, with the 200 having a double-braced base and aforementioned three-section clamp. The 400 is more of the same but with thicker tubing. The 100 and 200 sets came with the same HS-273 drum pedal (pictured above), while the HS-473 (pictured below) is the same basic unit with a couple of refinements. The heavier the hardware the more professional and roadworthy your kit. But there's an element of overkill about a lot of modern stands. At what point do you really need double-braced tripods? When it comes to hi-hats and snare stands single-braced tripods are often all you need for stable drumming. The single-braced 100 series snare and hi-hat will suffice for most drummers who want to keep the overall weight of their traps case to a minimum. Where single-braced tripods fall down (literally) is with over-reaching cymbal boom stands. 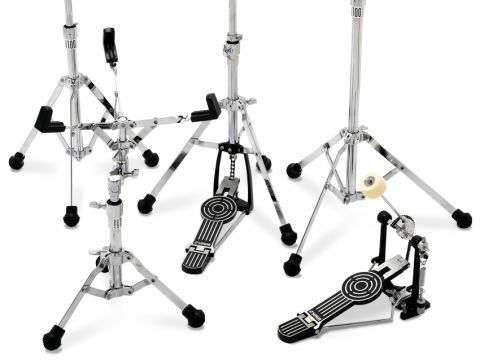 The two supplied bass drum pedals have identical basic construction, sharing the same single chain cam, expansion spring and distinctive Sonor Giant Step footboard. They also share the same adjustment of spring tension and drum key-operated beater angle/stroke. The HS-473 is bolstered by its full base plate and double-sided plastic/felt beater. Both pedals have the same thumbscrew hoop clamp which necessitates reaching under the footboard. It's just off-centre to the right, but still quite awkward to get at. You might have expected the 473 to have a more convenient side-action clamp. Coming to the hi-hats, there is much more of a marked transition from the small and light HH-174 to the enormously heavier and more sophisticated HH-474. The latter has recently benefitted substantially by nicking components from the upmarket 600 series. Thus it is the only hi-hat here which is multi-adjustable. It has both chunky plastic/nylon step-adjust tilter and spring tension adjuster. The footboard swivels through 120 degrees for ease of positioning and the centre pull rod is hexagonal for surer grip. Incidentally, the three hi-hats all have memory locks while none of the cymbal stands do. This does not matter in terms of stability - the section joints lock extremely tightly - but if you use memory locks for their original purpose of memorising settings then you're out of luck.